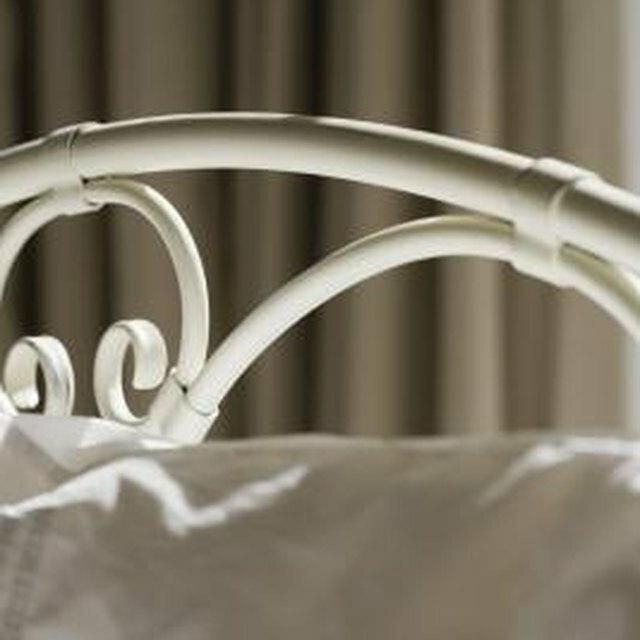 Over time the headboard and footboard of your bed can become wobbly through simple wear. This happens because the bolts that are used to keep your bed together become loose. Tightening the headboard and footboard to the bed is a simple task that requires only a few tools and a little bit of your time. Remove the mattress and box springs from the bed frame, as well as any boards that have been placed between the rails to support the mattress and box springs. Look at the headboard and you will see that the rails of the bed are connected to it with large bolts. These bolts may either protrude from the other side of the headboard and be fastened with a nut, or they may simply be screwed into the headboard. The bolts may also have a slot on their tops for a screwdriver, or they may have no slot. If there is a slot on the top of the bolt that looks like an "X" shape, you will need a Phillips head screwdriver. If there is a slot on the top of the bolt that is only one line, you will need a regular flat head screwdriver. If there is no slot on the top of the bolt you will need pliers to tighten it. Determine which kind of bolts you have. Center the railing on the bolt. Use either a screwdriver or pliers to tighten bolts that protrude through the headboard. You can use either a brick or a book to hold the rail in place. You will need to hold the nut on the back of the headboard with one hand while you tighten the bolt with the other hand using either the screwdriver or pliers. Repeat Steps 1 through 4 for the other side of the headboard. Push the footboard firmly up to the rails. As you adjusted the headboard the footboard will have most likely have tilted or dropped back from the rails. Line up the footboard with the rails, as you did for the headboard. Prop the footboard into place with a brick or book while you work to tighten the bolts. Use a screwdriver or pliers to tighten the bolts on one side of the footboard. Go to the opposite side of the footboard and use your pliers or screwdriver to tighten those bolts. Replace the support board on the rails, as well as the box springs and mattress. Check the bolts on the bed frame to see if they have been stripped, and if so this is a good time to replace them.